The disappearance and alleged murder of Saudi journalist and Washington Post columnist Jamal Khashoggi has done more than strike fear in the hearts of Arab journalists and intellectuals everywhere. The affair’s outcome, they say, holds in its balance the future of access to information across the Middle East. Arab academics and press freedom advocates warn of dire consequences if the United States and the West fail to hold Mr. Khashoggi’s killers accountable. Not only will it encourage strongmen to target journalists abroad, they say, it will silence the voices of reason and analysis in the region, strengthening dictators’ control over the narrative for decades to come. Arab journalists and academics are no strangers to intimidation, kidnappings, and violence; according to Reporters Without Borders the number of journalists detained in the Arab world has grown from six in 2010 to 102 in 2017 and 133 jailed this year so far. Twenty-three Arab journalists were killed in 2017; 19 have been confirmed to have been killed in the region this year as of October. Arab regimes have shut down local news outlets or taken them over, while some regional satellite networks have reverted to being mouthpieces for various kingdoms and alliances. Arab intellectuals and activists who wish to have their voices heard increasingly have gone into self-imposed exile for their safety – to Turkey, Europe, and the US. Other intrepid journalists who are not immediately in harm’s way have relied on the affiliation and protection of Western institutions, such as news agencies, think tanks, and universities. Arab regimes wouldn’t dare intimidate or target an American or European outlet, so they would reason. Angering key allies who supply aid, weapons, and political support would be too high a cost to move against them abroad, they said. The Khashoggi disappearance shattered this reality. Not only did Khashoggi have a high profile and connections to the Saudi royal family and Western governments, but he was apparently killed in the heart of Istanbul, in the very country that has vowed to protect Arab dissidents. Multiple academics and activists who preferred not be named owing to the increased scrutiny they are facing, all voiced the same concern: If the US government does not stand up for a writer for The Washington Post, what hope do we have? 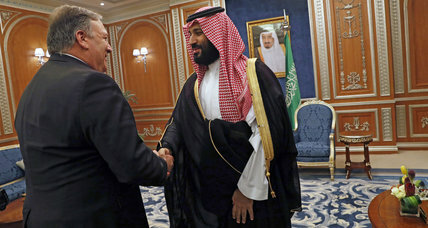 “If accountability for his disappearance is not achieved, the fear is that it will encourage autocrats and dictators everywhere – particularly in the Arab region but also much further beyond – to think they can target their opponents, irrespective of where they might be, without real consequences,” H.A. Hellyer, senior non-resident fellow at the Atlantic Council and analyst of the region, says in an email. Many fear that Saudi Arabia or another Gulf country – with its oil supplies, vast wealth, and patronage network throughout the Middle East and beyond – may “call in its debts” and pressure allies to allow a similar “disappearance” in their territory. Yet press freedom advocates warn that other Arab strongmen as well as Russia, China, and Turkey are likely taking note how far the US and the West are willing to go to hold a country accountable for the murder of a US resident and journalist for a US newspaper. “The outcome of the case can make or break whether there will finally be transparency and accountability for the targeting of journalists both in the Middle East and the West,” says Sherif Mansour, Middle East and North Africa program coordinator at the US-based Center for the Protection of Journalists (CPJ), who had previously advocated for human rights in Egypt. Press freedom activists and diplomats admit that the West, including the US, has a checkered past in protecting the Arab journalists, researchers, and analysts who uphold the very democratic and human rights ideals they promote. In recent years, several Arab academics, researchers, and journalists have carried out research on fellowships in the US and Europe, only to be arrested upon their return home for that very work. Most recently, Samar Badawi, who was brought to prominence by receiving the State Department’s 2012 International Women of Courage Award – handed to her by no less than then-Secretary of State Hillary Clinton and then-first lady Michelle Obama – was arrested this summer by Saudi authorities on accusations of treason for her work. Although she faces 20 years in prison for treason, there has been little pressure from the US for her release. Western diplomats say they delicately ask and follow up on the fate of these detainees, but do not push hard for their release, often balancing their countries’ shared economic interests, security ties, energy supplies, and stability against one man or one woman’s freedom. Yet observers say the Khashoggi disappearance marks the first time that the US is being forced to make that realpolitik calculation over a US resident. In this instance, the US is weighing accountability for alleged murder versus billions of dollars in arms sales, as President Trump implicitly stated last week. If the US chooses arms sales over accountability, observers say, a precedent will be set. “This chilling effect will impact and silence anyone who contradicts Saudi Arabia regardless of what their nationality or location is, and other states will take notice,” says Mr. Mansour of the CPJ. Moreover, press freedom advocates and Arab intellectuals warn, impunity over Khashoggi’s alleged killing will encourage Arab journalists and analysts to revert to self-censorship, to avoid writing anything critical of the policies carried out by strongmen in the Middle East and across the world. Already, some Arab journalists and academics say they are re-evaluating the cost of speaking to Western publications, institutions, and governments, with some considering “giving up” writing and commenting altogether. Observers say the intimidation and gruesome killing are all part of attempts by Arab regimes to control the narrative. “Arab regimes want to control the information coming from their countries, they will do anything to create barriers of understanding between the international community and their citizens to protect their interests,” Youssef Cherif, a Tunisian political analyst, says from Tunis, one of the last Arab capitals where intellectuals can speak freely. If Arab intellectuals and journalists are no longer able to speak out even in the West, and activists stop meeting with foreign diplomats and journalists, as intended, less information will come out from the Arab world on developments on the ground. Regimes wish to force Western states and media to rely instead on the official line from Arab governments; human rights abuses, economic inequality, environmental violations, and corruption will go unreported. Advocacy groups and citizens would no longer be armed with information to lobby their governments to adjust their policy in the Middle East. Even diplomats stationed in these countries would increasingly find themselves isolated. “If this happens, we will see a more ignorant and distorted view of the Middle East from the West, and Arab regimes will continue their violence, crackdowns, and corruption in their home countries with impunity,” Mr. Cherif warns. This very outcome in mind, observers say, led the killers to target Khashoggi in the first place. “Khashoggi was a voice for the voiceless, he was the one advocating for arrested Arab journalists who did not have a high profile and were being disappeared,” says Mansour.